Bo Eason, the world’s best speaking coach teaches you how to be the best speaker when it’s many people’s #1 fear. Do you want more money, freedom, and passion in your life? The only thing separating you from what you want is mastery of your personal story. Master your story and start winning! Enroll in the Personal Story Power Online program and I will personally help you extract your personal story and turn your life and your body into a magnetic experience for your audience. When I was 9 years old, my dream was to become the best safety in the NFL. In 1984, that dream came true. After my seventh knee surgery, which ended my professional football career, I began another 20-year commitment: To become the best stage performer on earth. After being coached by Al Pacino, after writing my own play … after performing that one-man play on and off Broadway thousands of times, that dream came true. I didn’t know this at the time, but that play did more than just allow me to live into the dream of achieving greatness on stage. It gave me a voice. I didn’t have to wait for the phone to ring anymore. I created my own platform, my own business. Everything about my life changed through story. Storytelling is everything today. It is the tissue that connects us all to one another. It is irrefutable and undeniable. That’s why it’s so effective. There’s no line. In fact, it erases every line that divides us and brings us together. Once you start using all the miles you’ve run and scars you’ve collected to share yo s surself and connect with others, it’s over. The stage, or field, you’re performing on gets bigger, as do the opportunities you have to take your life to the top. Years ago, I committed myself to spending the next 20 years of my life fighting for your story. My mission is to give you the tools critical for discovering, expressing and sharing your personal story with the world. My all-star team has helped me create a formula that takes you, right where you are, and extracts the juiciest, most crucial story (or stories) of your life. We’ve developed a way for you to take that story and mold it into the kind of story your audience won’t be able to forget. Twice a year, we all assemble in La Jolla for an intimate event called the Personal Story Power Event. Less than 120 seats are available and we usually sell out. Even at this moment, our next event is sold out! But you don’t have to wait 6 months or more to start the journey of discovering the stories of your life that will make you utterly unique and magnetic. Your greatness… your ability to be the absolute best in your field of work… it all comes down to how effectively you can tell your unique story. You see, I’ve spent my entire life preparing for the next Personal Story Power program and if you’re the right person, this could elevate you to two or three levels beyond where you currently are… When I say I’ve been preparing for my entire life, I don’t mean that lightly. It is my job to give you the tools and coaching so that you can discover your personal story and enjoy the level of success other graduates have experienced. The mindset needed to fully connect with your audience and how to get in that state every performance, like clockwork. Confidence is self-created and with this training, you’ll understand why it’s your birthright to be on the stage. How to capture your greatest personal stories. You’ll cut past the “dump” stories and find the gems that will keep your audience begging for more. How to use your body intelligently and effectively. I’ll help you link every word of your story to the molecules of your body, allowing you to express your story, through your hips, your hands and your movement. This is exactly the opposite of what our politicians do and you’ll be able to keep the attention of your audience by this alone! The exact rehearsal rituals I do every single time I speak to an audience. Everyone has a will to win, but nobody has the will to rehearse. I’ll teach you the secrets of rehearsing so by the time you’re on stage, you’re fully confident. Clear your mind, focus on the training and create clear goals or outcomes you want to achieve with this course. As you’re listening to me get your mindset where it needs to be to fully absorb this training, you’re reinforcing what your intentions are so that there’s no confusion about what we’re trying to accomplish together. Everything we do over the course of this training has a purpose. We don’t waste time, which is why you have to surrender to the training and agree to play full out. Capture the basics of your personal story. These writing exercises are taken directly from the event and are the building blocks we use to flush out your story. So many people say to me, “Bo, I don’t know where to begin.” And usually that’s because they’re overcomplicating the process. These exercises are simple, straightforward and will help you start connecting the experiences you’ve had in your life. Get physically warmed up ahead of a big client meeting, presentation, event, etc. This warm-up has become a sacred ritual for me. I rely on it ahead of every performance. It frees me up so that when I’m about to go on stage, I’m not even thinking about what I’m going to say. Now, my whole life is about preparation so I’m always rehearsing, but this is about you performing with your truest self so that no one will be able to look away. You’ll also receive the digital version of my best-selling courses, the Personal Story Power Pack – normally sold for $497 on it’s own – is yours at no additional cost! 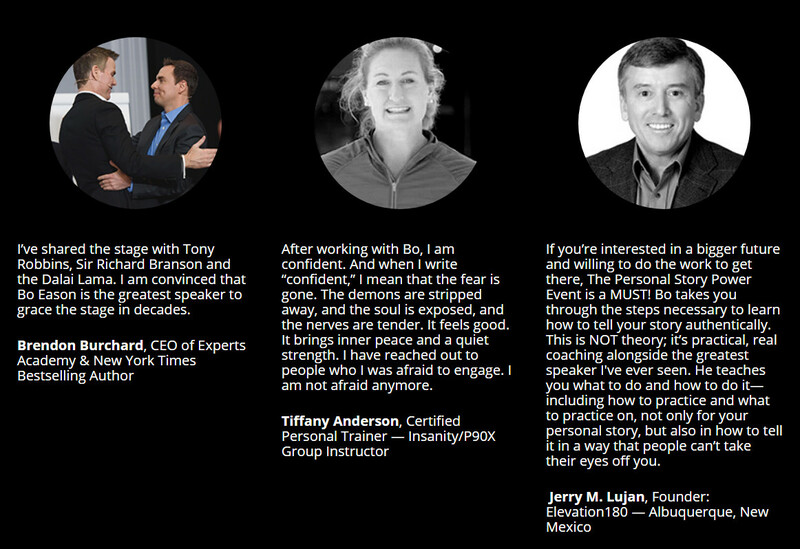 6 hours of audio training, where Bo teaches you how to “cash in” on your personal story. A hard-bound leather journal for you to begin putting pen to paper to write your story! Take Bo’s content with you while you’re out and about! You don’t need a DVD or CD player… Everything is available in our online portal in PDF, MP3, and video. A total value of nearly $1,500 for only $997! If you’re ready to get off the sideline and put in the work to be The Best, join Bo by clicking the banner below.